Welcome to the 20th edition of my BullCharts software Tip Sheets, focussing on tips and hints for BullCharts (the Australian charting software package). I am sending this one to both the BullCharts users and my Toolbox Members for interest. The BullCharts scanning feature (often just called BullScan) is both feature-rich, and simple to use. Many people can utilise it fairly easily; but it can take a while to understand all of it's useful features. So in this Tip Sheet I cover off some useful aspects of BullScan, and answer the question: "I have done a scan, and I can see the Scan Results Table, complete with a few columns of information, but how can I save that table for use later?" The columns in the Scan Results Table - how can I include more details? How can I save the Scan Results Table as a Watchlist? To do all this, I will use a realistic Case Study sample scenario. Don't forget to visit the BullCharts section of my Share Market Toolbox web site for more useful information about BullCharts (my Toolbox is an arsenal of weapons to help you tackle the share market). And the Tip Sheet Archive Section and the Index page for information about past Tip Sheets. Don't forget that help with BullCharts is available for you. You can participate in the Australian BullCharts User Group for free - even if you don't live in Melbourne. And you can have free access to the Yahoo Forum with miscellaneous useful files and messages. The group meets monthly in Oakleigh. More details are on the web here. And Robert is available to help you as well - in the form of one-on-one tuition, either in person (at your place), or over the internet. The fees are very reasonable. More details are on this web page. 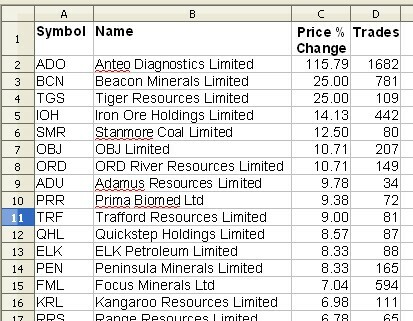 In this case study example, I want to see a list of my favourite stocks at lunchtime, and sort them by percentage change today. To do this I will take a market Snapshot at lunchtime. And I want to run a BullCharts scan over my favourite watchlist to calculate the percentage change in share price since yesterday's close. And I want to sort the resulting list of stocks in order of percentage change with the largest change at the top, and the smallest at the bottom. Show the Price % Change over 1 bar. Number of Trades is greater than 20 every bar in the last 3 bars - to weed out the thinly traded (illiquid) stocks. The option Price % Change is available under the scan Category drop-down selection for "Is a price or chart field". For any of the items you select in the top of the Scan Criteria box, it is possible to just "Show this value" in the Results Table. The "Use Snapshot" check box is ticked, to use the Snapshot data instead of "today's close" prices. When I ran this scan at about midday today (14 January), across the stock list "All Securities", I ended up with a Scan Results Table as in the accompanying screen shot (click on it for a larger image), containing some 408 securities. 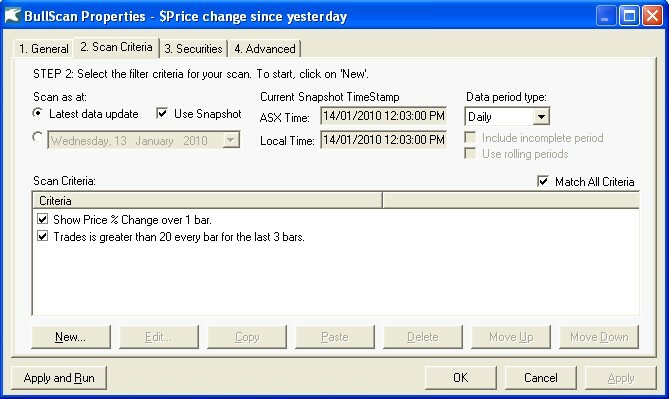 Notice the very top title bar of this table contains the name of the scan - in this case "$Price change since yesterday". If you want to include more columns in this table, it is a simple matter to just add them as extra Criteria in the Scan Definition. You can simply select "Show this value". Don't forget that every time you run a scan, there is a watchlist saved automatically - it is called "Last Scan Results". You can rename this watchlist to anything else you like. And you can move it into a Watchlist folder. 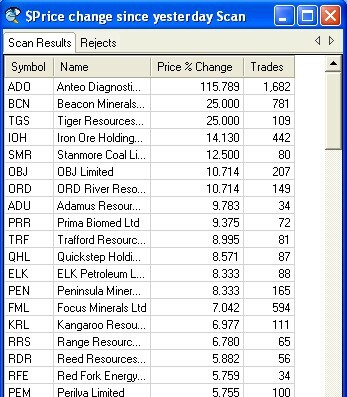 The next time you run a scan, the existing "Last Scan Results" watchlist will be replaced with the results of the latest scan. But, this watchlist is only a list of the securities. It does not include any of the numbers that were displayed in the Scan Results Table. As far as I know, there is no way to reproduce the scan results table without running the scan again. And if you run the scan on a different day (or using a different snapshot), then the results will potentially be rather different. Now let's say you want to save the data from the Scan Results Table for some reason. There are two ways to do this: either (a) "Export" the data to a CSV file; or (b) "copy and paste" the data into a spreadsheet (or a text document). How can we "Export" just a few lines of the Table and not all of them? See the comments in the next section below about "selecting" specific stocks in the list. Click once some where on the Scan Results Table to make sure it is the "active" window pane. You now need to "select all" in this window. You can use the Ctrl key and the letter A, or the BullCharts menu option: Edit - Select All. Now, copy all of the selected data into the Windows Clipboard as follows: Either use the Ctrl key and the letter C, or the BullCharts menu option: Edit - Copy. Now open up your spreadsheet program (or whatever). In my case, I use Open Office Calc (not Microsoft Excel). In your spreadsheet program, with a new spreadsheet open, simply "paste" the Clipboard contents - either with the Ctrl key and the letter V, or use the menu option: Edit - Paste. And there you have it. The Scan Results Table is now in your spreadsheet program for you to save, and do other things with. Right-click some where on the Scan Results Table, and from the drop-down menu choose: "Create as Watchlist". This will create a new watchlist with the same name as your Scan. In this case "$Price change since yesterday". And it will contain ALL the stocks in the results table. If your results table has a number of stocks, and you want to create a watchlist containing just some of the stocks, then just "select" the required stocks, and right-click and choose "Create as Watchlist". To "select" the required stocks, there are two options as in many Windows programs: (a) For a consecutive group of stocks, click once on the first one in the group, then hold down one Shift key on the keyboard and then click once on the last stock in the list; or (b) click once on the first desired stock, then hold down the Ctrl key, and while holding the Ctrl key down, just click on each desired stock to build up a number of "selected" stocks. This applies to the "Export" option as well. Don't forget that you can re-sort the list of stocks in the Scan Result Table by clicking on a column heading (and the sorted column will display a small triangle in the column header). How to add some stocks to an EXISTING watchlist? - This is another option in the drop-down menu. Just select one or more stocks, and choose "Add to Watchlist" from the right-click drop-down menu. These bi-weekly Tip Sheets for BullCharts* users are intended to be short, quick grabs of information. They are not a replacement for the monthly detailed Brainy's eNewsletter articles, which cover these same topics but in much more detail. The eNewsletters articles also cover Technical Analysis and Share Trading topics. Note: Any screen shots shown in this newsletter are snapped from BullCharts version 3.8.4. FEEDBACK? - I am very keen to receive feedback about these weekly BullCharts Tipsheets. Please feel free to email me with comments, or suggestions or questions to be answered in a future Tip Sheet. Contact details are included below. They will be in March (just a few weeks away) - session details, dates, costs, venue, etc. are on my web site here. The regular venue I now use for most sessions is the Vermont South Community House. To enrol for any of these, you need to contact the VSCH directly by phone or email.